In this tutorial, I will show you how to install and configure OTRS on Ubuntu 16.04. I will use PostgreSQL as the database for OTRS, and Apache web server as the web server. In this first step, we will install the Apache web server and PostgreSQL. We will use the latest versions from the ubuntu repository. Then make sure that Apache and PostgreSQL are running by checking the server port. You will see port 80 is used by apache, and port 5432 used by postgresql database. OTRS is based on Perl, so we need to install some Perl modules that are required by OTRS. When the installation is finished, we need to activate the Perl module for apache, then restart the apache service. 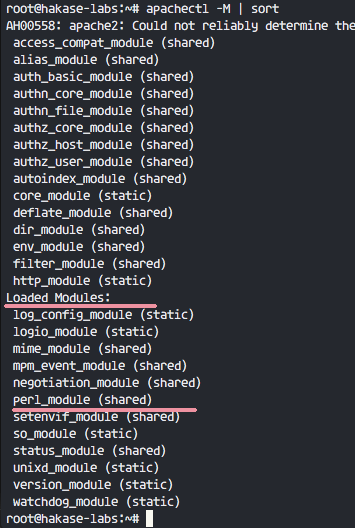 And you will see perl_module under 'Loaded Modules' section. OTRS is a web based application and running under the apache web server. For best security, we need to run it under a normal user, not the root user. -r: make the user as a system account. -d /opt/otrs: define home directory for new user on '/opt/otrs'. Next, add the otrs user to 'www-data' group, because apache is running under 'www-data' user and group. Check that the otrs user is available in the '/etc/passwd' file. New user for OTRS is created. In this section, we will create a new PostgreSQL database for the OTRS system and make some small changes in PostgreSQL database configuration. Login to the postgres user and access the PostgreSQL shell. Create a new role named 'otrs' with the password 'myotrspw' and the nosuperuser option. Next, edit the PostgreSQL configuration file for otrs role authentication. PostgreSQL is ready for the OTRS installation. In this tutorial, we will use the latest OTRS version that is available on the OTRS web site. Extract the otrs file, rename the directory and change owner of all otrs files and directories the 'otrs' user. Next, we need to check the system and make sure it's ready for OTRS installation. Make sure all results are ok, it means is our server ready for OTRS. OTRS is downloaded, and our server is ready for the OTRS installation. Next, go to the otrs directory and copy the configuration file. Then edit apache startup file to enable PostgreSQL support. Finally, check for any missing dependency and modules. In this tutorial, we will use the sample database, it's available in the script directory. So we just need to import all sample databases and the schemes to the existing database created in step 4. Login to the postgres user and go to the otrs directory. 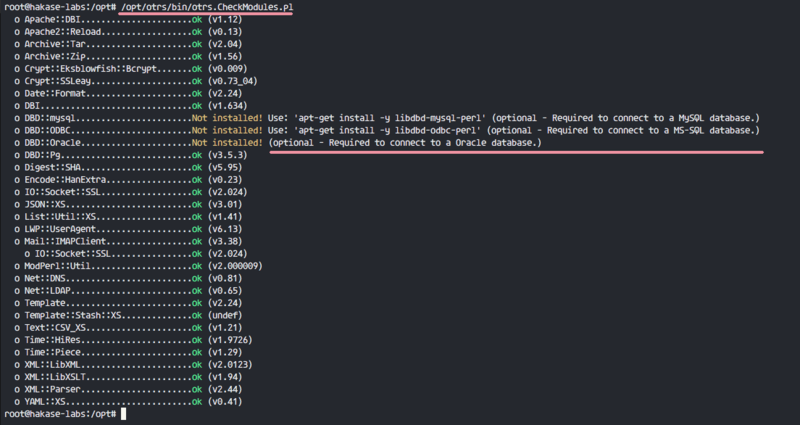 Insert database and table scheme with psql command as otrs user. Type the database password 'myotrspw' when requested. 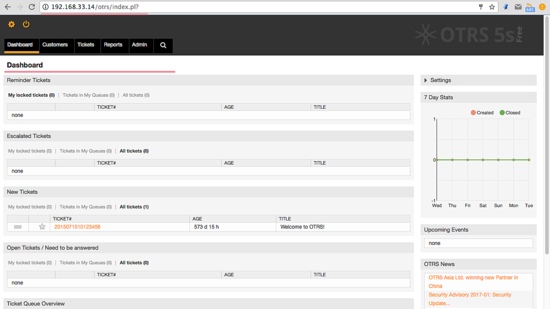 Database and OTRS are configured, now we can start OTRS. Set the permission of otrs file and directory to the www-data user and group. Then enable the otrs apache configuration by creating a new symbolic link of the file to the apache virtual host directory. Enable otrs virtual host and restart apache. Make sure apache has no error. 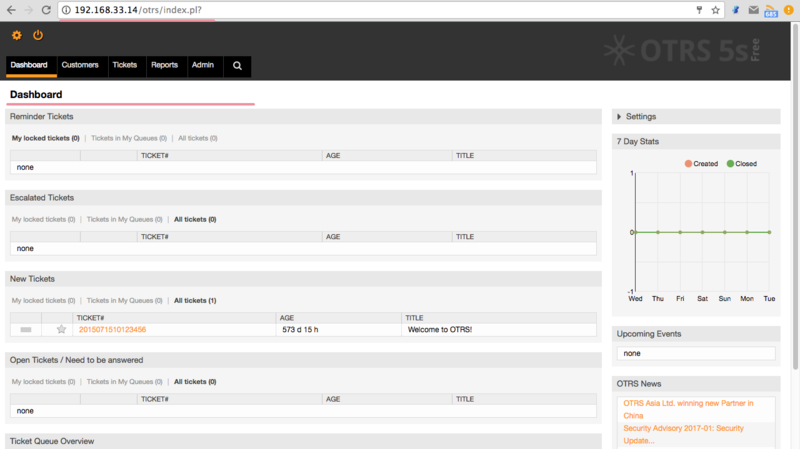 OTRS is installed and now running under apache web server, but we still need to configure the OTRS Cronjob. 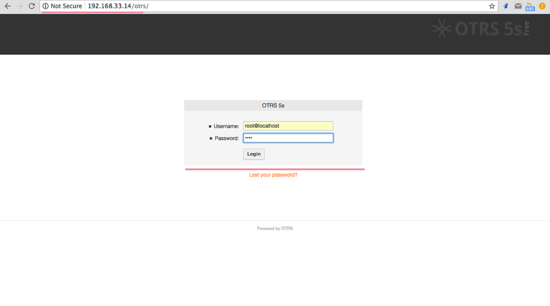 Login to the 'otrs' user, then go to the 'var/cron' directory as the otrs user. Back to the root privilege with exit and then start the cron script as otrs user. 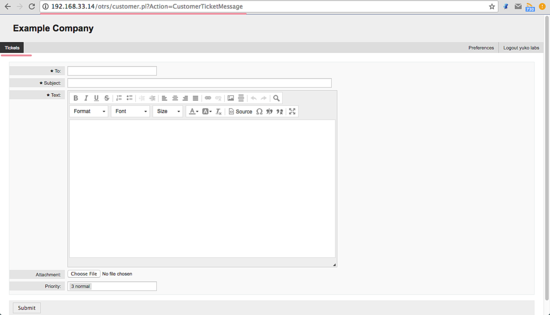 Next, manually create a new cronjob for PostMaster which fetches the emails. I'll configure it tp fetch emails every 2 minutes. Now stop otrs daemon and start it again. The OTRS installation and configuration is finished. Login with default user '[email protected]' and password 'root'. You will see a warning about using default root account. Click on that warning message to create new admin root user. Below the admin page after login with different admin root user, and there is no error message again. If you want to log in as Customer, you can use 'customer.pl'. You will see the customer login page. 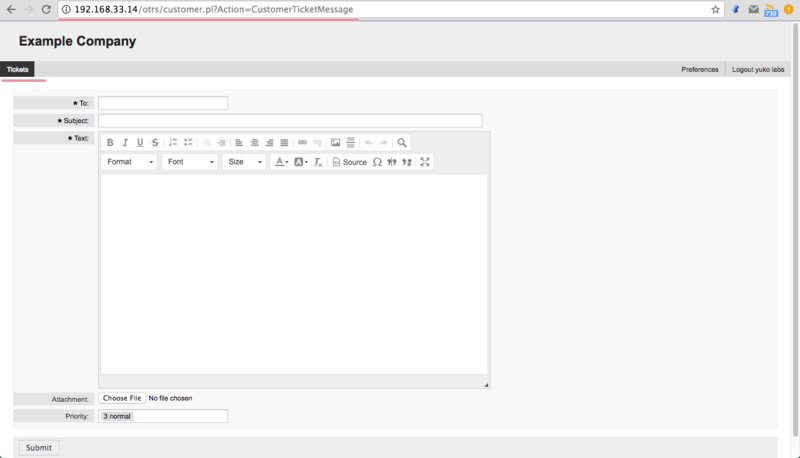 Type in a customer username and password. Below is the customer page for creating a new ticket. If you still have an error like 'OTRS Daemon is not running', you can enable debugging in the OTRS daemon like this. 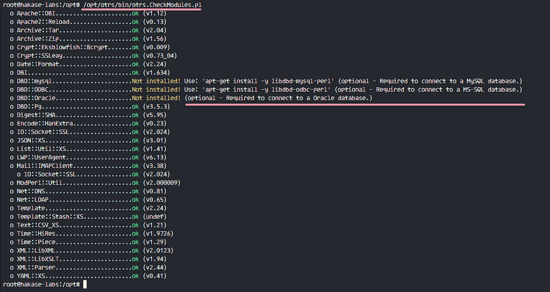 And start OTRS daemon with --debug option. Should it be done under otrs? Amazing document .. hats off to your for hard work! Is good for me ! How to fix it? Thanks!!! Hi, Thanks for this extensive document. Followed this and everything went as mentioned, except that it did not take the default password. Tried a lot but jus tdid not help. Any pointers? I have the same problem. Can you tell me how can I fix it? Message: No deployments found in Database! I'm also having that same error when starting the Daemon. When I try to pull up OTRS in the web browser, it won't load. Any idea on how to fix this? Something broke somewhere along the way.